The Tuolumne River is, in many ways, the perfect whitewater rafting or kayaking trip. Chock full of fun, manageable Class III and IV rapids in a beautiful California foothill canyon, the “T,” as river folks lovingly refer to it, is challenging enough to suit the adventurous souls, and while it’s not a Cancun beachcomber weekend, it’s relaxing enough to feel like a vacation. Who should go: Wilderness lovers and intermediate paddlers who want to get away from it all. Read more about Tuolumne River Whitewater. Make sure to get started early because water shuts off from Holm Powerhouse at 11am. If you are doing are doing a trip on Cherry Creek, prepare for an early morning! Learn more about Tuolumne River Flows. Keep reading about Tuolumne River Logistics. 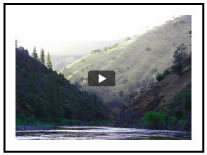 Watch a Tuolumne River video before you see it up close. Buy gear and other supplies for your whitewater trip on the “T” in Groveland, Sonora or Online.